Do you want to get strong and fit in no time? Are you looking for a way to workout at home and get the results you need? Are you tired of wasting a fortune on gym memberships? The Double Circle wooden gym rings are exactly what you've been looking for! The Double Circle workout rings are made with the best quality materials and special attention to detail for flawless results. The wooden rings are very strong and durable and they are 100% non-slip for maximum stability. Forget about the exercise rings that are too difficult to install and that you can never get right! These wooden rings have premium quality straps that are very strong for maximum durability. They are numbered for flawless and symmetric installation every time! You can use these amazing gym rings for every workout, from crossfit to bodyweight exercises. We also provide you with a useful exercise guide to get more workout ideas and get shredded fast! ★ PREMIUM QUALITY CONSTRUCTION: The Double Circle 1.25" Olympic rings are crafted to perfection with the best quality wood so they can be incredibly strong and durable. And unlike the usual plastic ones, the wooden rings are completely non-slip so you can have a strong and comfortable grip at all times. ★ ULTRA CONVENIENT STRAPS: The CrossFit rings are very easy to install and they have premium quality and ultra-convenient 1.5" straps. The straps are extra wide and very strong for maximum performance and best results. They also are numbered for easy installation and symmetry and they can adjusted according to your needs. ★ NEVER MISS A WORKOUT: Forget about having to go to the gym for your workout and wasting money on expensive gym memberships. You can now get a killer workout at home and wherever you go with the Double Circle athletic rings. The wooden rings are very compact and lightweight and they come with a convenient travel case, so you can easily carry them! ★ GET FIT FAST: And because we want to help you get your dream body fast, we give you with every set an amazing exercise guide for FREE! 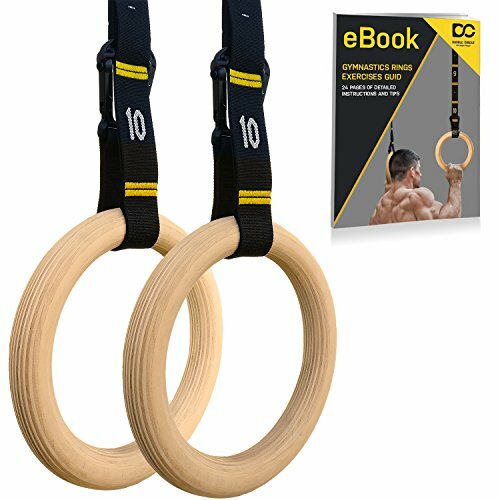 This unique guide is packed with incredible exercises using our wooden gymnastic rings for your upper body so you can get the muscular body you desire! ★ ORDER WITH CONFIDENCE: Your satisfaction is our top priority and this is why we strive to provide you with the best products and service. So if for any reason you are not completely satisfied with our gym rings, we will give you a full refund or a free replacement with no questions asked! If you have any questions about this product by Double Circle, contact us by completing and submitting the form below. If you are looking for a specif part number, please include it with your message.